Freshly emptied ex-Rum barrels (40 Gallon/225L). 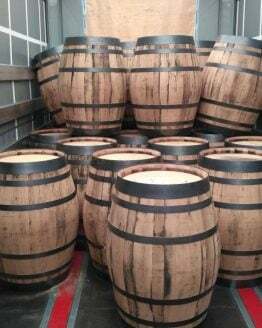 Recently arrived, straight from the rum distillery heavy duty and solid ex-rum barrels. These barrels were originally used as American whiskey/bourbon barrels (See Jack Daniel’s stamp in pictures for example). The barrel’s steel hoops are rusty but solid. They may be missing an odd hoop but this will not affect the structural integrity of the barrel. 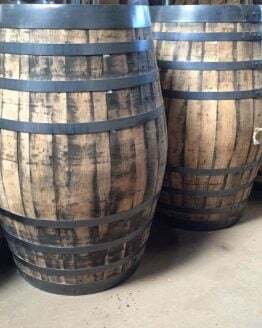 The end of these barrels may be warped in places – please let us know if you intend to use them for a rum barrel table – we will try to ensure that one is sent as flat as possible. Made from steel bands and thick, solid oak staves. 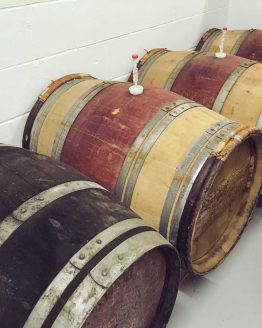 All of our steel bands are pinned to the barrel, ensuring that they do not fall off and maintain the barrel’s strength. Please note, these barrels are not guaranteed to be watertight due to their age.